Rampant group of LMDs, number.. 3? Unexpected. While Epidurium is marginally cute, the idea of it being rare? Explain all those LMDs SHIELD has then. Explain how SHIELD nearly got taken over by LMDs that one time. 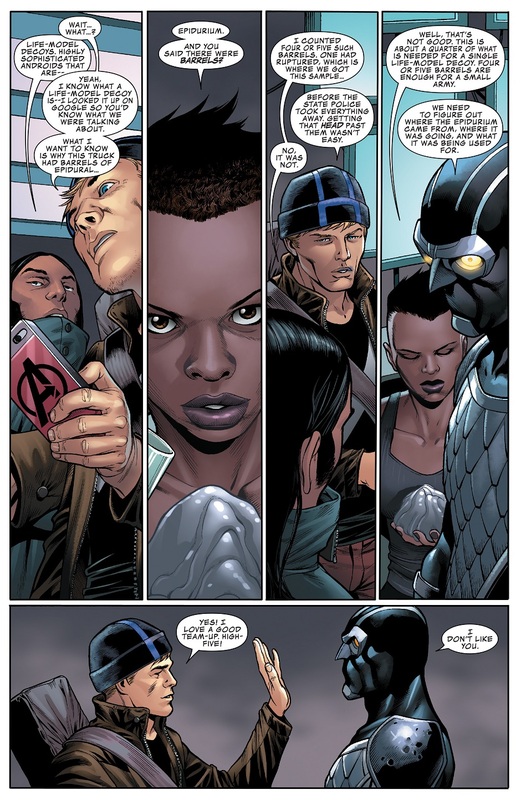 ... while the writing is kind of bleh, Hawkeye's little Hawkhat is so cute. Yeah, "epidurium" is a very odd plot point to make. SHIELD could have its resources, but that doesn't mean it would be easy to come by for anyone else. The flaw in that suggestion is that it requires SHIELD to be competent at something. 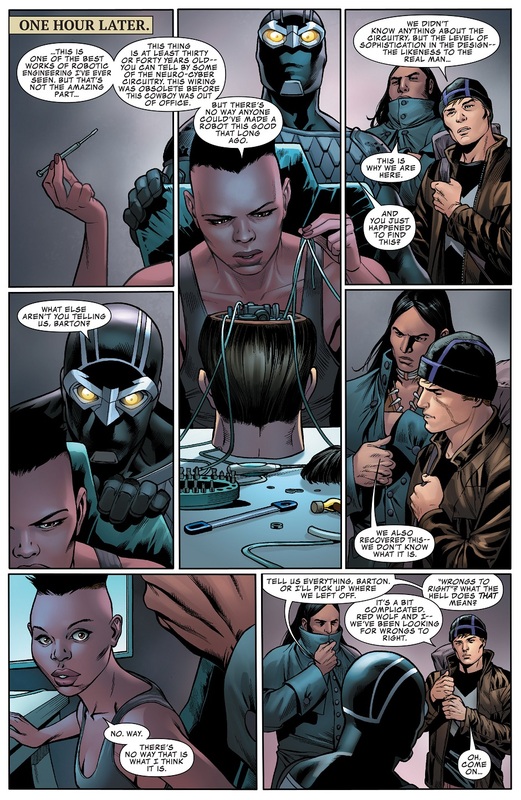 I think the most ridiculous part is that the woman telling them how rare Epidurium is, Nightshade, once used a small army of ridiculously human robots to take over the protection rackets in Harlem. If robot doubles are that pricey, that was one terrible business plan. No one ever became a supervillain with reasonable business plans. Why is Red Wolf dressed as Mark Dacascos' character from the Brotherhood of the Wolf? Did they come straight from a cosplay convention? THANK YOU! That was bugging me but I couldn't recall the exact film! Because Mani is AWESOME is why. 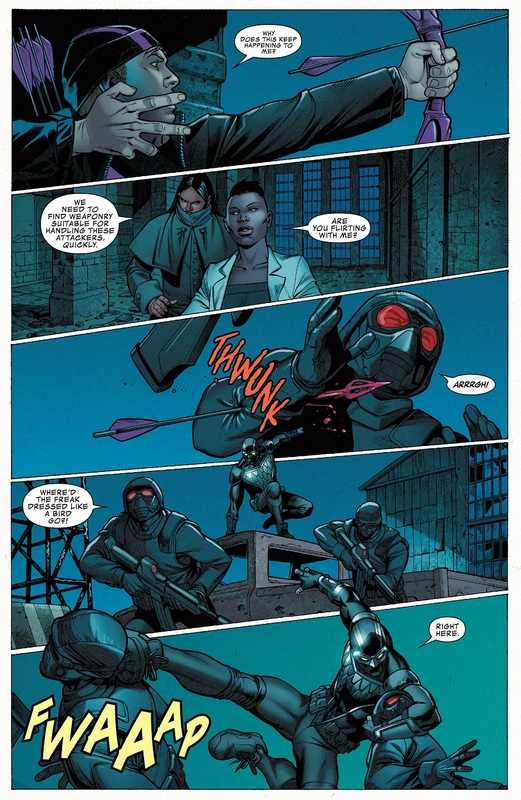 That panel where Clint is holding the bow with the arrow pointing downwards... he can't possibly plan on shooting the arrow any time soon; his bow arm is in completely the wrong position for it. Given that Red Wolf is standing directly behind him, I assume that they're posing for a team-up photo. 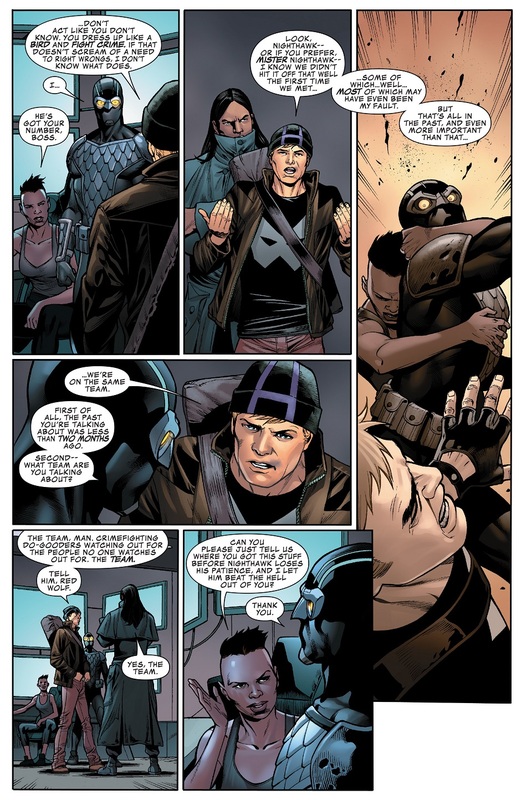 Hawkeye's whole dialogue here sounds like he's being deliberately obtuse and annoying but I might be giving too much credit. 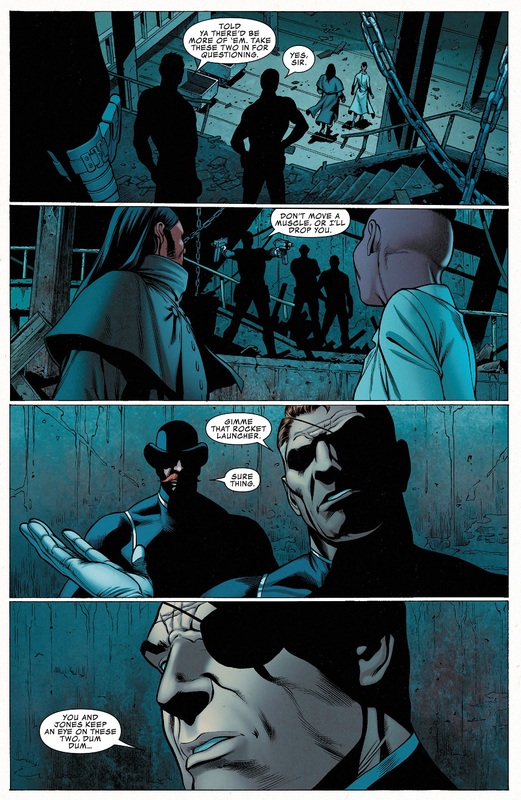 So is this before Fury became the Watcher, or is that what's supposed to make this a whole "Oh sh--" moment? I assumed they are all LMDs. Like with Mr Sinister's clone producing factories, every time there is an absence of Fury LMDs, one is activated. That makes sense, too. Just wasn't sure if this was a situation where that was necessary. I thought every Fury and Dum Dum LMD had been either destroyed? 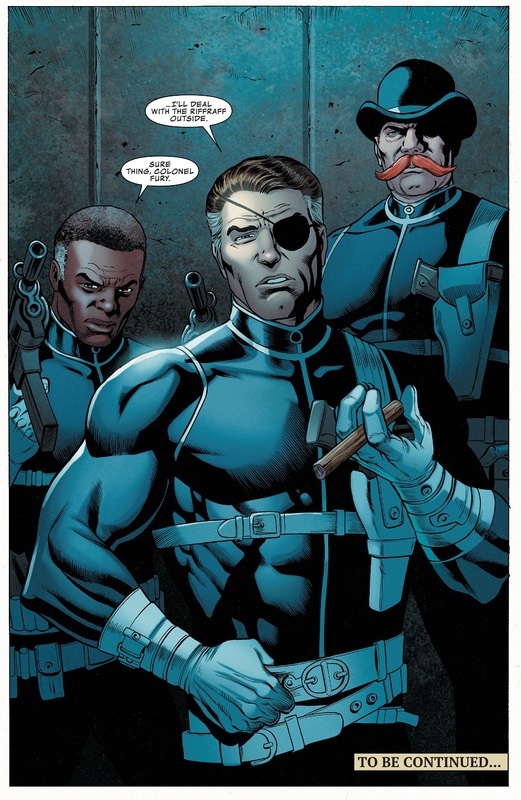 Nevermind it's Nick Fury. The man would have backup LMDs. It's like every time the Joker dies. 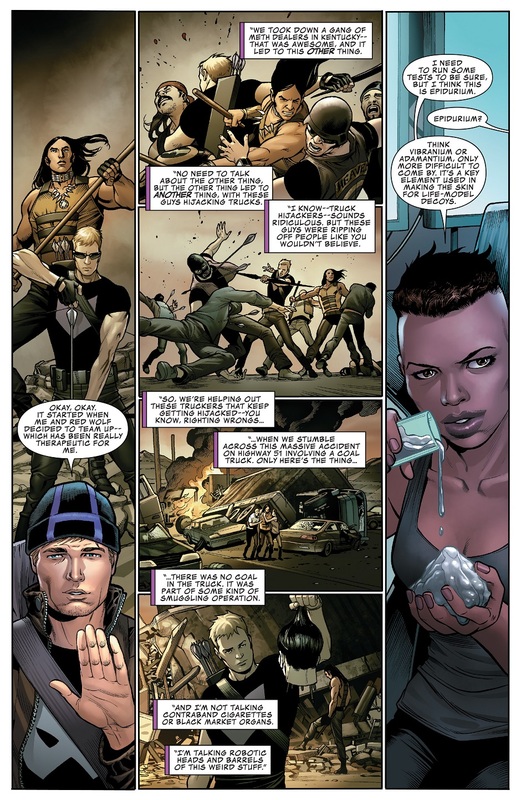 This time they're really gotten all the Nick Fury LMDs. For real! Absolutely! This time for sure! And they mean it! And then two weeks later there's another one Nick Fury squirreled away somewhere. A Doombot for you and a Doombot for me! 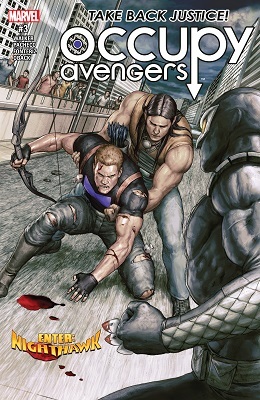 God, I love it when Hawkeye's costume goes street. I'd totally buy this costume if it ended up on Marvel Heroes.